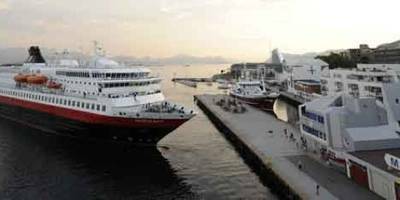 Milestone Systems' open platform IP video management software (VMS) is installed in the Hurtigruten ferry 'MS Nordlys'. Essential ship operations covered by the surveillance system include: guest reception, the retail shop, unloading and loading, wharf landings, car deck traffic, the bridge overview and the engine room. Video from the engine room helps the engineers on board to make sure that everything is in proper working order. Monitoring also ensures additional safety for the crew in the engine room; colleagues located elsewhere on the ship can be alerted if something happens that needs a fast response. The camera installed on the mast also lets the captain see the color of the engine smoke that could signal a fire has broken out below. Hurtigruten say they may add more cameras in the future, and the Milestone open platform can flexibly expand as needed to manage this. The company is also looking at intelligent video analytics: 'people counting' is an integration that can be beneficial in emergency situations such as an evacuation of the ship.